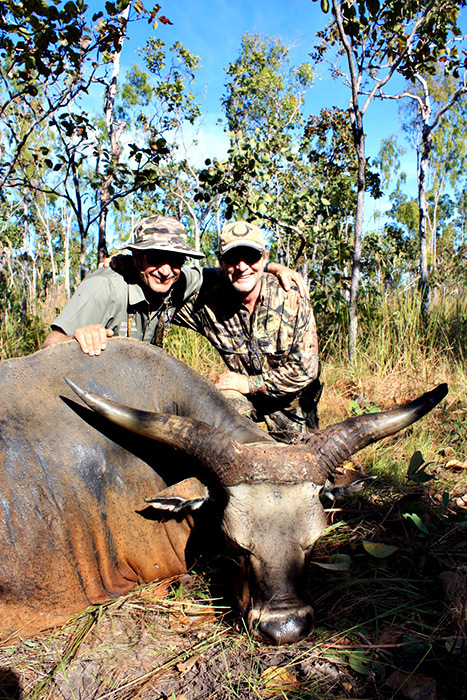 Banteng are the most coveted trophy in the south pacific and Australia’s Northern Territory has the only free range hunt able population in the world. 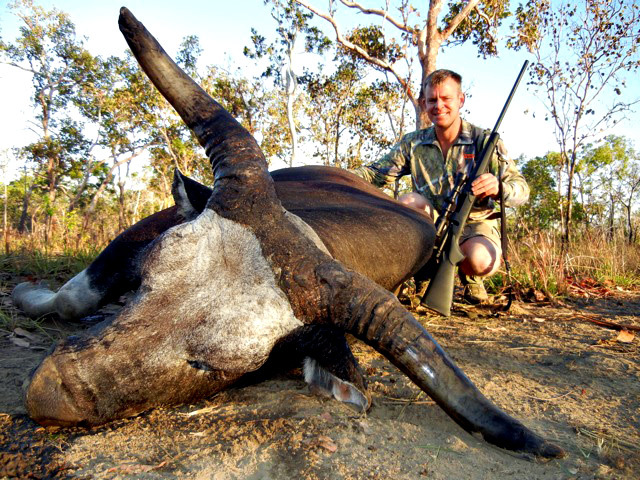 Our outfitter has the sole rights to the best concession producing the best trophies without any doubt! In 1849, 20 Banteng cattle (also called Bali cattle or Bos javanicus) were brought to the Cobourg Peninsula in the Northern Territory from Bali in Indonesia. Banteng are smaller than beef cattle and have distinct white patches on their rump and lower legs. The European settlement on the Cobourg was abandoned shortly after the animals were imported, and the cattle were left to run wild. They survived as a feral population, unknown to scientists, until they were re-discovered in that isolated area in 1948. It is now a National Park and part of the Aboriginal Territory known as Arnhem Land. 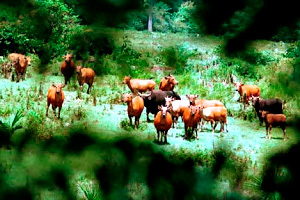 This area is synonymous in the world of Banteng hunting. Banteng frequent the coastal fringe grassland and paper bark strips that meander along the coast for miles. 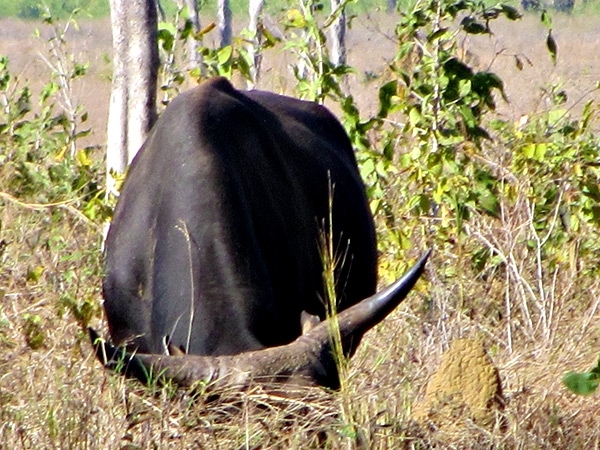 These areas are often broken up with billabongs and lush jungle type vegetation which Banteng visit for food and cover. Other areas in these fringes consist of estuaries and thick mangroves that have salt pans which the Banteng enjoy because they lick they salt that has been left behind by receding tides. The horns of a mature trophy bull measure around 17 inches in length with some exceptional bull’s taping out to the 21 to 22 inch mark. The average circumference of the horn basses is around 12+ inches. The style of the horn can vary considerably. The benefits of operating outside the Cobourg National park are great, as we are not so burdened with the restrictions placed on the operators in the park. We can access all areas of our concessions via ATV’s UTV’s, Helicopters, airboats and basically any means necessary allowing us to get much closer into prime hunting areas without having to walk in from the public roads. Also the topography of the area is suited to sustain a much bigger and healthier herd of animals than the Cobourg region. The trophy size of the animals consistently taken and seen is much greater than those taken from Cobourg. 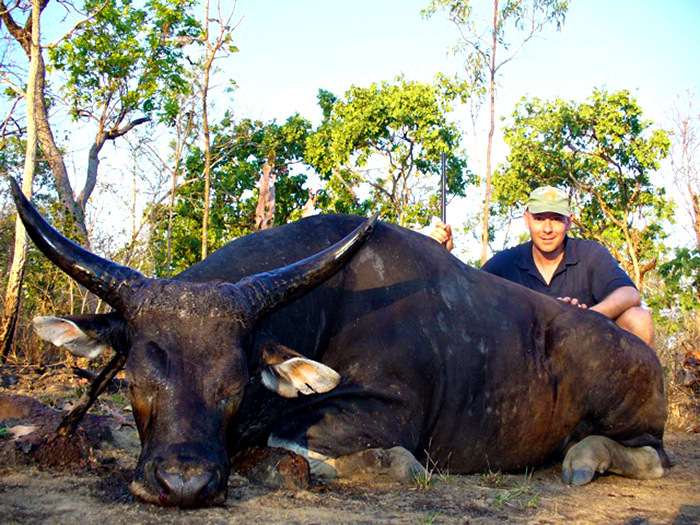 2010 saw four top 10 bulls taken three by rifle 73 6/8 SCI the other two hitting 74 SCI, and the No.2 Bull taken with a bow being 70 SCI, as well as these bulls 4 with the potential to smash the no.1 SCI have been seen on this concession two of these can be verified by video that was taken of them. 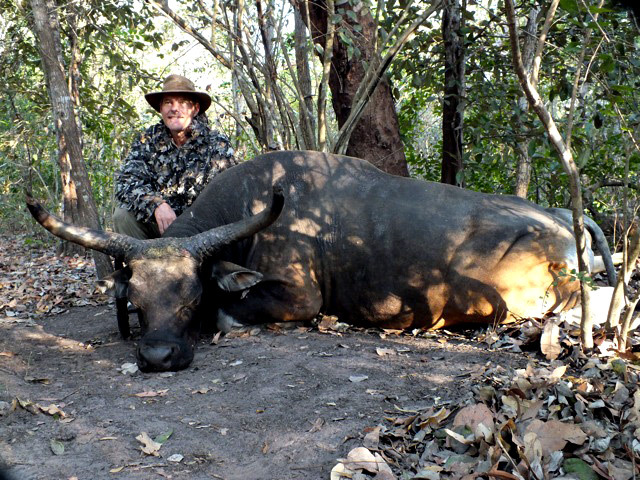 I had put one in front of a client with a clear shot at 80m but the client froze and did not get a shot and the bull moved into heavy cover and did not present another shot that he was comfortable with. 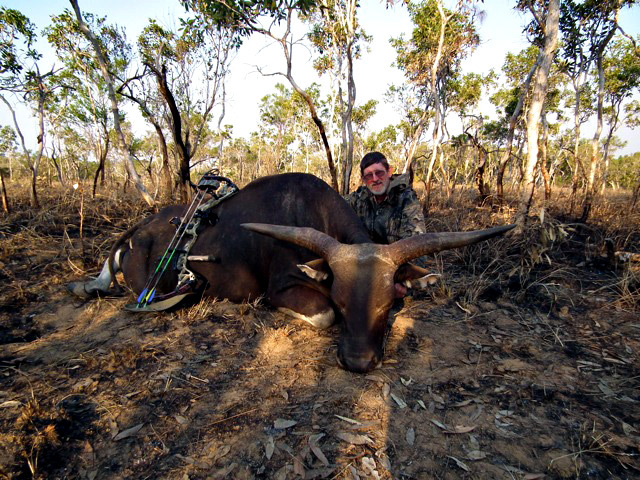 The other 3 were all seen on hog hunts and the clients were not hunting Banteng. All clients can expect the highest level of equipment when hunting with our outfitter and with a wide range of ATV’s, UTV’s, Trucks, boats and other equipment we have what it takes to get you to the animals, with the best equipment and concessions we are consistently taking exceptional truly wild free range animals on a regular basis. 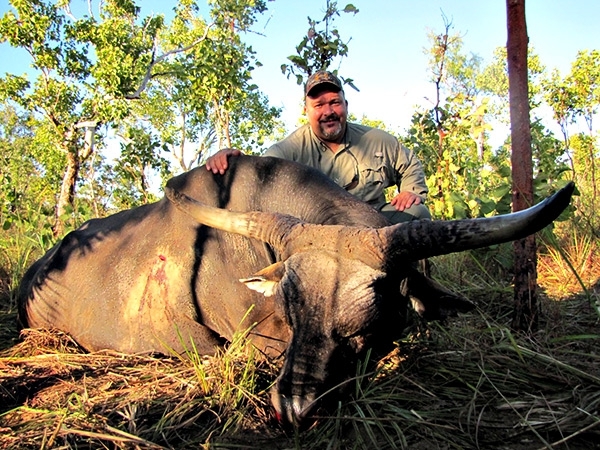 A hunter who has been honest about their capabilities allows four full days of hunting and follows direction from the guide can expect to have a good shot at a bull of around 68points (Gold Medal SCI). 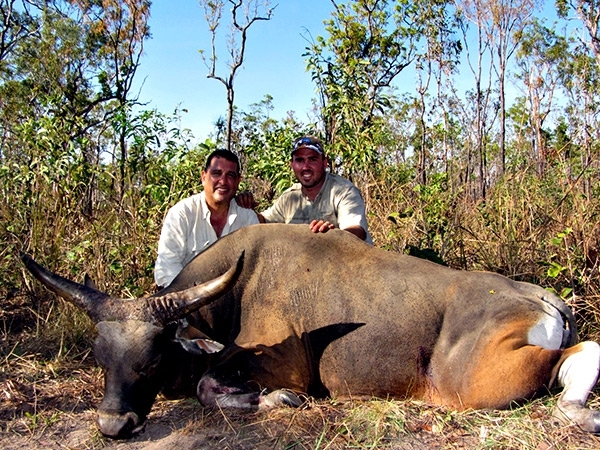 We usually allow around 4 to 5 days for a Banteng hunt; this is generally ample time to secure a trophy bull. 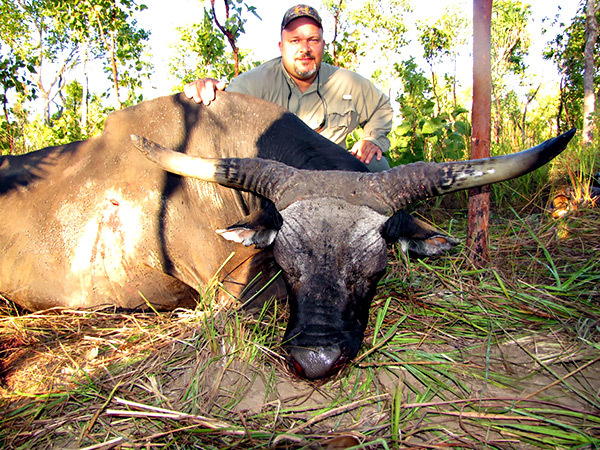 It’s not uncommon to see 5 or 6 trophy bull’s one day, and 80 to 100 Banteng all up. A hunting day can be long with the usual rise before daylight, and at times returning to camp after dark. Like many animals the best time to locate them is in the evening or early morning. During this time they can be spotted feeding freely in the grasslands and less timbered areas. During the heat of the day they rest and head inland to cooler and more heavily timbered areas. During a hunting day it is not uncommon to cross paths with Brumbies, Wild Boar, the odd Buffalo and Crocodiles can also be sighted. Entry for hunters is mostly done by light aircraft to a local airstrip some 30 kilometres away or by vehicle and a 6 hours trip that comes with it. Hunting this concession can only be done with our outfitter as he has an exclusive legal agreement for the area. 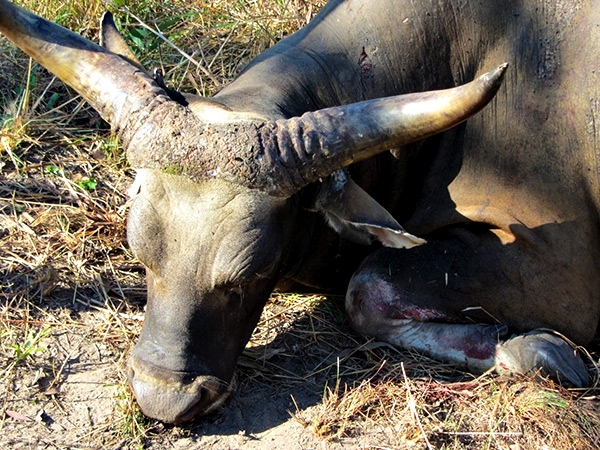 All Banteng harvested are recorded and come with certificate of origin for export.